With LeBron James announcement to re-join the Cavaliers over the weekend, the people of Ohio were expectantly ecstatic. One woman, however, got a little too excited as she crashed her Jeep through a fence and into a backyard pool as a party was going on. Two people were swimming in the Lakewood, Ohio pool at the time and narrowly avoided getting pancaked. “I took a dive into the pool and when I hit the water, I was like ‘Oh man, that’s an awesome explosion I did,” said one of the toasted party goers. It’s unclear how many bong hits he took to the dome, but he was definitely shocked when he saw the Jeep. 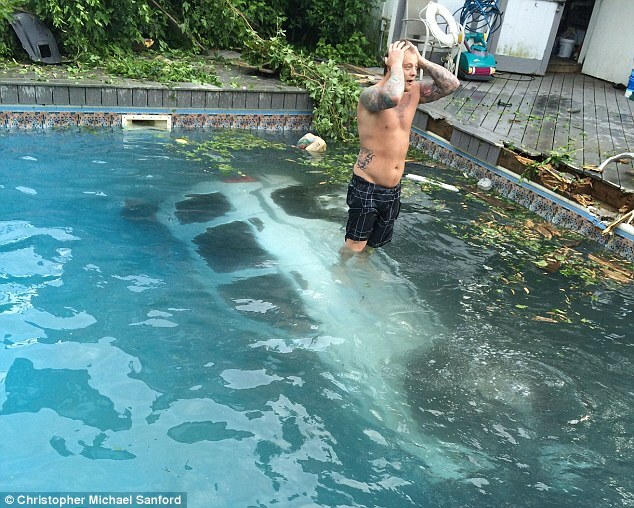 “Then, I turned around [and] there was a Jeep in the pool,” he continued to describe to WEWS-TV. After the collision, the two men did heroically pull the driver from the submerged vehicle. She was then taken to the local hospital to minor injuries. The swimmers, thankfully, were unharmed. According to reports, the woman drove through an apartment complex fence before crashing into the backyard. Police have yet to announce whether the woman will be charged or not. This entry was posted in Culture and tagged crash, jeep, Ohio, pool, two swimmers. Bookmark the permalink.